Over 150 families received their title deeds in Mdantsane on Friday 06 July 2017 NU1 Community Hall. 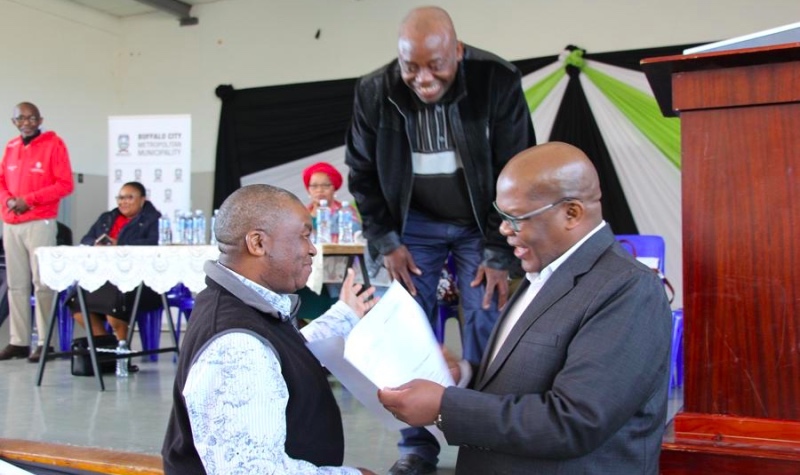 The Executive Mayor Cllr Xola Pakati handed over title deeds tobeneficiaries that have been living in sharing houses for years. Pakati further added that they were not doing favours when they do such things and that it is their duty as government to serve the people and ensuring that people in the society get the services they deserve. NU 6 resident Mphumzi Kawulela whose mother died waiting for her title deed said he was happy that he finally received the title deed. Portfolio Head for Human Settlements,Cllr Nozandile Mhlola said that this was not the last batch of title deeds and that they will not rest until all deserving families get their title deeds.